LiAngelo Ball, one of three UCLA basketball players placed on indefinite suspension following their shoplifting arrests in China, will be leaving the team and the university, officials said Monday. 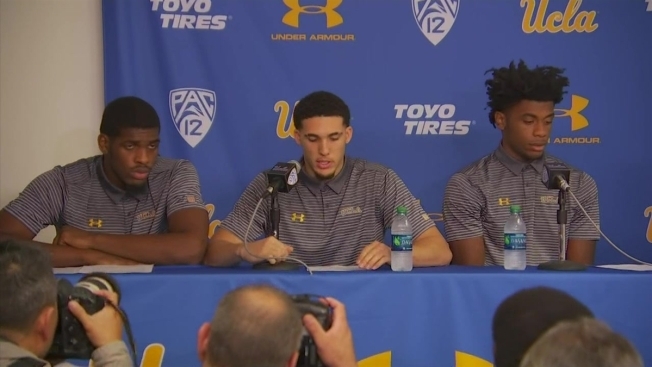 "We learned today of LiAngelo Ball's intention to withdraw from UCLA," Bruins basketball coach Steve Alford said. "We respect the decision he and his family have made, and we wish him all the best in the future." Ball and his outspoken father, Lavar Ball, appeared on the "Today" show Tuesday and said that a two- to three-month suspension is too long to wait. "That's the whole season pretty much, that's just a long time not to be playing," LiAngelo Ball said. Ball, the brother of Lakers rookie and former Bruin Lonzo Ball, was arrested in early November along with Jalen Hill and Cody Riley while the UCLA team was in China to take part in a season-opening game against Georgia Tech. They were detained for about a week in China before the case against them was dropped, with President Donald Trump saying he spoke on behalf of the players to Chinese President Xi Jinping. Lavar Ball first told ESPN he decided to pull his son out of UCLA. "We are exploring other options with Gelo," he said. "He's out of there." TMZ broke the story, but reported that LiAngelo Ball had not yet officially withdrawn from the university. Lavar Ball noted that China dropped the charges and said, "Now we're over here, we've gotta serve more punishment?" He said he'd train LiAngelo to get him shape and headed to the NBA. The elder Ball also told NBC's Natalie Morales that he sent Trump three pairs of the family brand's sneakers in "red, white and blue to show him we're patriotic."